If it’s new, if it’s recently been unpacked, or if it’s off limits altogether, there’s an excellent chance that your cat will find it and claim it. Those are boxes from just unpacked frames I ordered courtesy of King of Frames. I can’t say enough about Randy Higbee’s company and the quality of his frames and service. I stopped painting to unpack them ( it’s the ADD in my soul ). I just placed this gilt beauty on the countertop and came back to learn that in 90 degree heat and humidity what could be better than sleeping on bubble wrap especially if you possess a fur coat. I’ll have to order another frame. This is her official cot. Good. Now that she’s settled in, I can finish this piece. I use Ultramarine for most things but there’s a shot of Cobalt Blue in his shirt that really pops. Wakes up the other colors too. Bet it can’t wake up that cat, though. This entry was posted on June 9, 2010 at 12:07 am and is filed under Animals, Art, painting, photography, St. Croix. You can follow any responses to this entry through the RSS 2.0 feed. You can leave a response, or trackback from your own site. Thanks kseverny ( or can I call you Richard ) I’m thinking this could have been the origin of the expression ” the cat’s pajamas “. And the frames are great! Thanks Patrice from both myself and Angel who loves when people talk about her. ( she was really hoping that you’d apply ” fabulous ” to her but it’s best to keep cat egos in check. LOL! What a wonderful live picture she makes in the frame. I like your Day’s Done painting, too. Paz- she cracks me up every time I walk into the studio- this is now an everyday thing. Gave me a head-nodding chuckle. Your brushwork is so fluid and leads the eye around the composition. Lots of energy in that contemplative conversation. Sure you chuckled Sharon, as Dave’s and Babush’s mother, you know that they’re comfortable anywhere they have a pulse. Don’t we wish we could say the same! Nice new painting, Bonnie! Another winner, and you are right about that blue. Now why don’t cats get stiff necks after sleeping like that? I would. Don- I think cats are the lesser known members of the invertebrate family. Body torque-ing is built into their DNA. Humans just get arthritis. I laughed and laughed when I saw the position she managed to twist herself into. Those damn pets of yours could have a TV show all by themselves. Now, onto your painting. Impressionistic and beautiful. Love the cobalt blue. Love their expressions. Guess they are talking about where to go to get a cold beer. Another wonderfully emotive painting. Carol- for a while, I only liked half of this painting and put it down for a few months. Then I went at it again and it behaved. Know when to hold em, when to fold em and when to give them CPR. Those animals are my entertainment center- glad you appreciate their worth too. Carol’s right; let em get their own damn show. The dogs n cats definitely have star-power, but they’re upstaging you! This painting is a veritable treasure hunt and leads my eye around it from clue to clue. I could make comments about lots of the parts, but it deserves to be seen as a whole enchilada. Okay, one part. I could look at how you modeled their skin for a long long time. Amazing. Sam, I will always be happy being upstaged by these critters. Unless it results in art patrons requesting audiences with them instead of me. The skin- funny how it took me a while to decide that I liked how it worked. I’m really glad you said that. Say, you’ve got some gallery archivists gone wild, for sure. Lovely, bright and sunny painting. Well done! Best wishes in wrangling those frames! Thanks Melinda- yup, they went so wild they had to take a nap after the heavy duty work day they put in. Muse or music, I’d rather paint with my muse. Great painting. I like the cool greens and blues against the warm body parts. 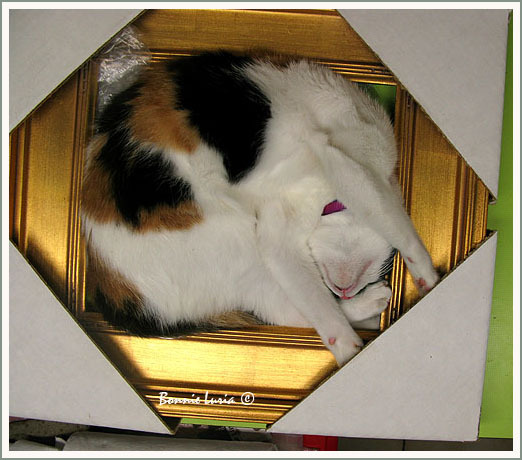 Yep that sure looks comfy laying in that frame. You should order a bigger version for yourself. Thank you Bill- I always appreciate your comments. And the only reason that animal looks comfy is because they can sleep on nails, upside down AND in 100 degrees. I’m lucky if I can get to it in a luxe mattress with pills as an aide. Never thought to try a 6′ X 3′ frame….. Your cat is hysterical, Bonnie. I had a cat that loved it when packages arrived. She would sit right there and watch me opening it knowing she would get the empty box. While I was busy on the task, she would several times reach out and stroke it with a paw several times and then rub against it. She would also watch me unpack groceries for that one paper bag I would always request. I miss her. Your paintings are always interesting. They all tell stories. I think that is what I like about your work the best! Leslie- missing a cat- I know that means you don’t have her but remembering her antics keeps them alive in spirit. Actually wouldn’t it be contradictory or at best erroneous to think that cat’s don’t HAVE antics? I’m glad the story aspect comes through in the work. It’s good to know that it comes across. There are so many stories to tell. Always glad you stop by. Are you back on the island now? Those pics are toooooooo funny. Oh, cats. I couldn’t live without them. She apparently knew how good she already looked…and knew that a good frame enhances the beauty of art. …Or perhaps we’re just gilding the lily? By the way, that’s a beautiful painting. Is it new? Jala- Nope- not yet. Still drinking in NY everything and a little behind ( not that I HAVE one, I just am one ) in looking at everyone else’s blog. The painting is one that I did a while ago but was never happy with it and put it down for a while. But I really loved the left side. It was worth going back into it and re-working the other side. This time, it seemed to pull together. PS- very very observant of you to notice her paws tucked under the cardboard- even I didn’t notice that. The Gilded Lily ( clever girl you are ) is so delicate and weightless- I suspect Rumi has the same body type. P.S. Had to go back for another look at Angel (Lily). Noticed she has front paws tucked under the cardboard triangle, thus preventing an otherwise unwanted spring-uncoiling action. Smart! Actually the cat looks terrific in the frame!! 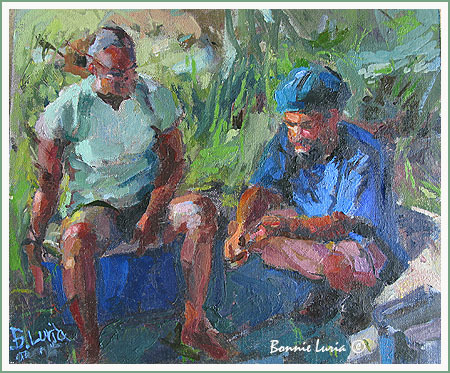 Bonnie, your paintings are always so filled with life, freshness and story… I love the beautiful blend of colors and shapes!! 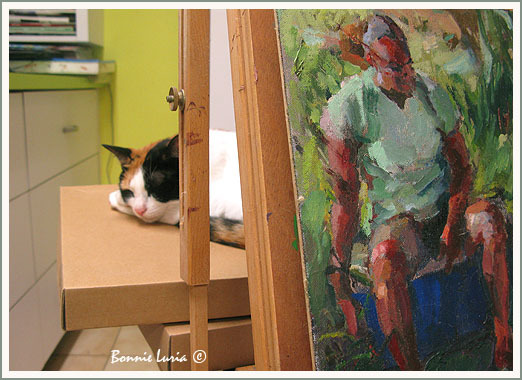 Marian- I’m framing the kitty and petting the painting. So glad you like the piece- I wouldn’t give up on it as I’ve done on others. HiLaRiOuS photo and nice painting, island girl! I also love the green hues in your parasol- lady painting. David! A nice surprise to hear from you. And see that you’ve been scrolling. Love to know you still drop in here, fellow comrade of all things aesthetic. Lovely painting, Bonnie. The figures are so expressive! You colors are so rich. Thanks Jay- for the visit and the much appreciated comment. CATS! I’ve got one next door that each year manages to bat down the bird’s nest behind my outside porch decoraton and smashes the eggs. Each year the birds keep building and the cat keeps tearing down. Grrr. I luv your painting, tho!! I found the nextdoor neighbour’s cat sleeping in a big plastic garbage can I use for storing my empty’s … I mean recyclables around the side of the house. It scared the crap out of me!